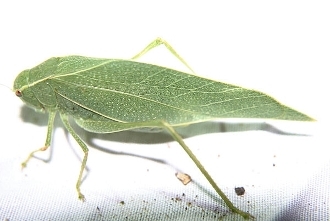 Katydids are in the Order Orthoptera, Family Tettigoniidae. They resemble grasshoppers, but are more active at night. By day or night their calls are often mistaken as those of crickets or grasshoppers. Most species are green while some are brown or a mix of both colors. Many resemble leaves right down to convincing venation in their wings. Many of our specimens are stored in alcohol and may fade to a tan to yellow color.